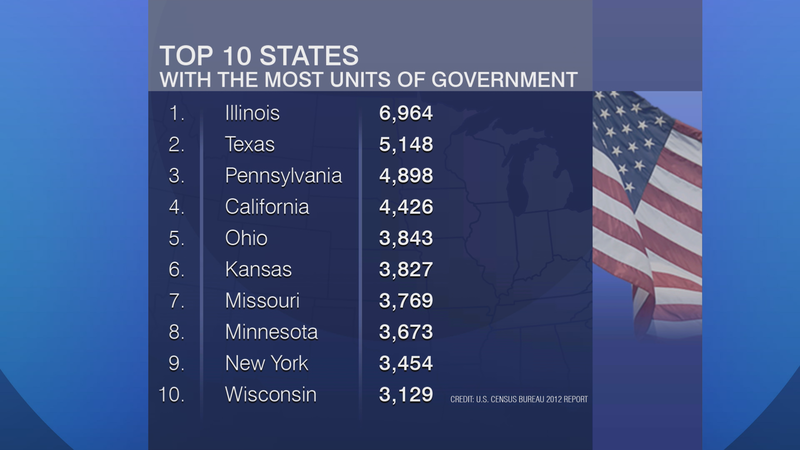 How many units of government does Illinois have? We know the basics: city government, state government, county government. But then there are smaller bodies, like townships, sanitary districts, and mosquito abatement districts – all of which collect property taxes. Maryland, for instance, has 347 units of government; Virginia 497. 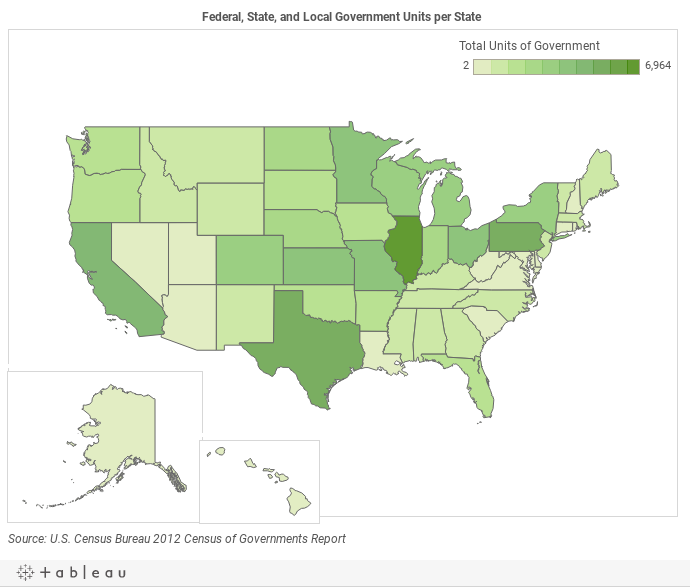 Illinois has 6,964 local units of government, according to the U.S. Census Bureau. Watch the video: Here to help answer that question on Chicago Tonight are State Sen. Linda Holmes, who is a member of Governor Rauner's Local Government Consolidation and Unfunded Mandates Task Force; Andy Shaw, president and CEO of the Better Government Association; and Robert Porter, administrative coordinator for the Township Officials of Cook County. Lt. Gov. Evelyn Sanguinetti In a city that has 50 aldermen, it might not come as a surprise that Illinois has the most units of government in the country, nudging out the competition with 6,964 governmental bodies, according to the U.S. Census Bureau. This fact isn’t lost on Gov. Bruce Rauner, who created the Local Government and Unfunded Mandates Task Force to come up with recommendations on how to trim down that number. In the United States there are 90,107 units of federal, state and local governments, according to the U.S. Census Bureau 2012 Census of Governments Report. Scroll over the map below to see how many units of government each state has. Illinois has 6,963 units of local government, according to the U.S. Census Bureau, and the chart below illustrates how those units are categorized. For more information on how the state classifies its many units of local government, read the Individual State Descriptions 2012 of the 2012 Census of Governments (Illinois’ information starts on page 80 of the report).